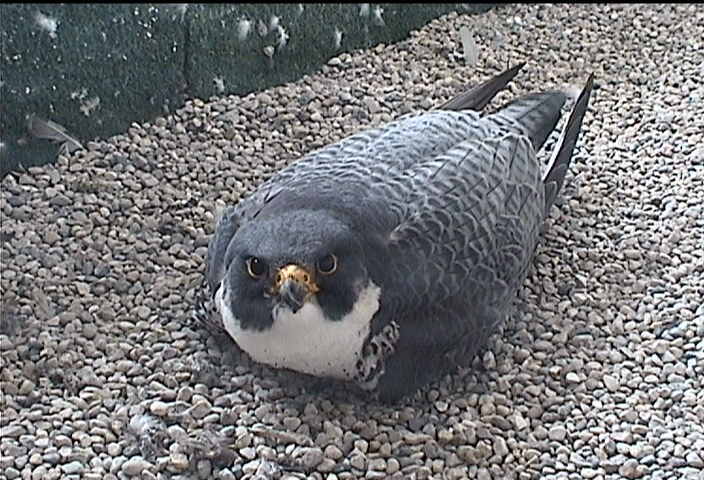 Peregrine Falcons have been present on the UWM campus for several years, frequently seen soaring above or perched on several of the high rise buildings on campus. 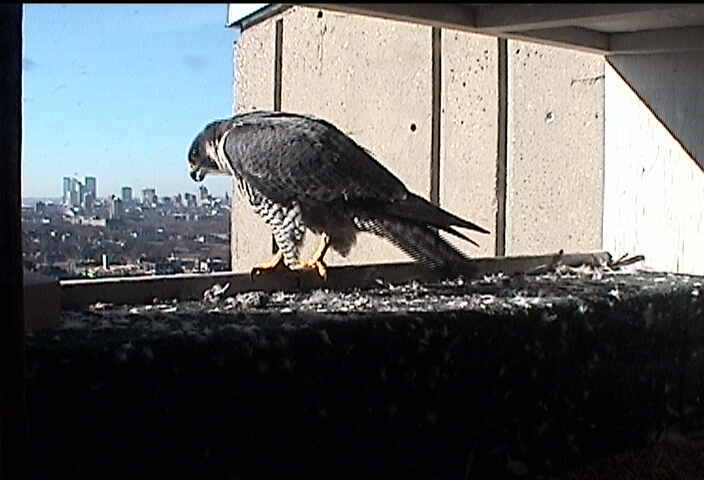 In particular, much activity has been observed on the Engineering & Mathematical Sciences Building. 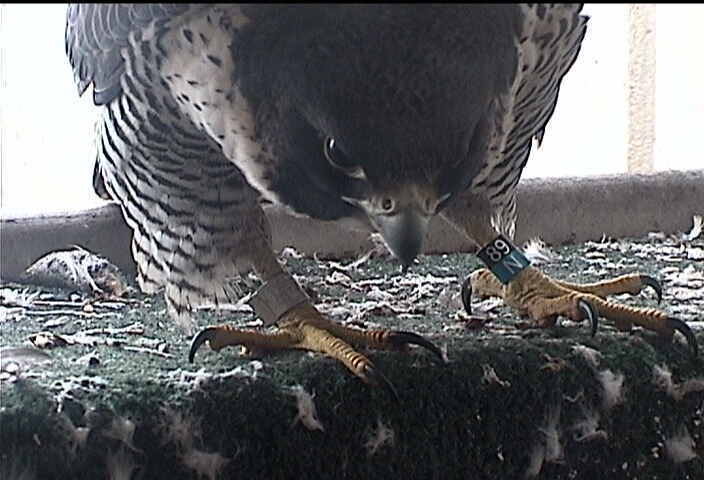 In the fall of 2007, Greg Septon of the Peregrine Falcon Recovery Program, toured the EMS site and encouraged University officials and scientists to build and install a nest box at the site. 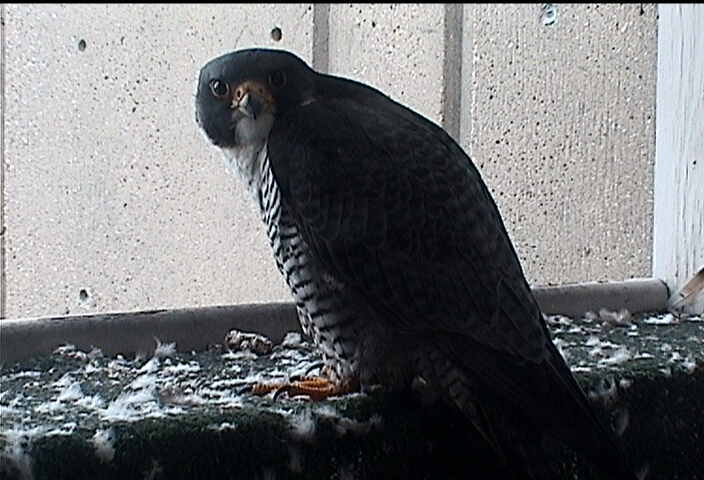 Plans were drawn up for the box, UWM Physical Plant carpenters and other trades workers constructed and installed the nest box at a site chosen on the roof of the EMS building. Department Biological Sciences faculty and staff provide scientific observation and data reporting. Thomas Hansen from the WATER Institute, Monica Cloutier from UTIS and Thomas Schuck from Biological Sciences helped construct and maintain this web site. 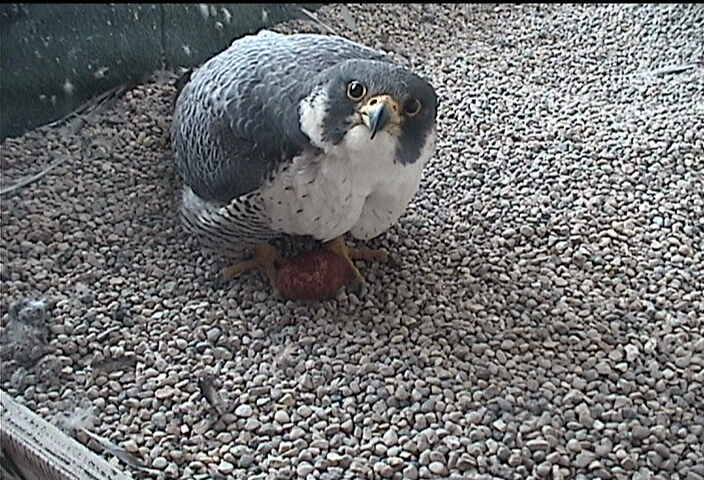 4-12-2019 – Female sitting on eggs. 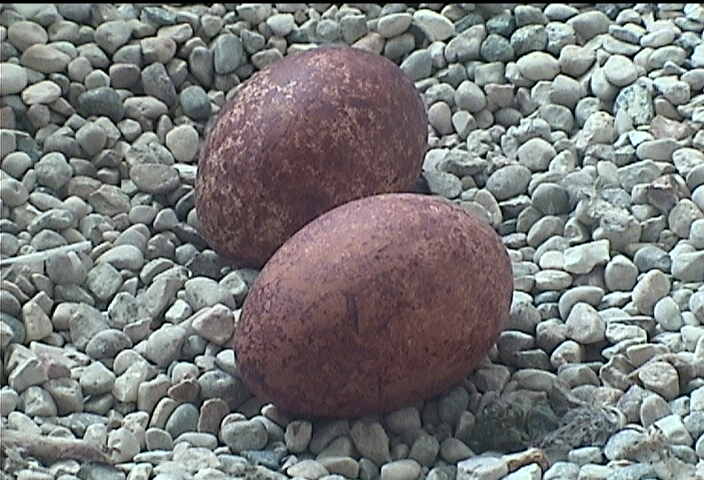 4-10-2019 – The 4th egg was laid today ~12:00pm. 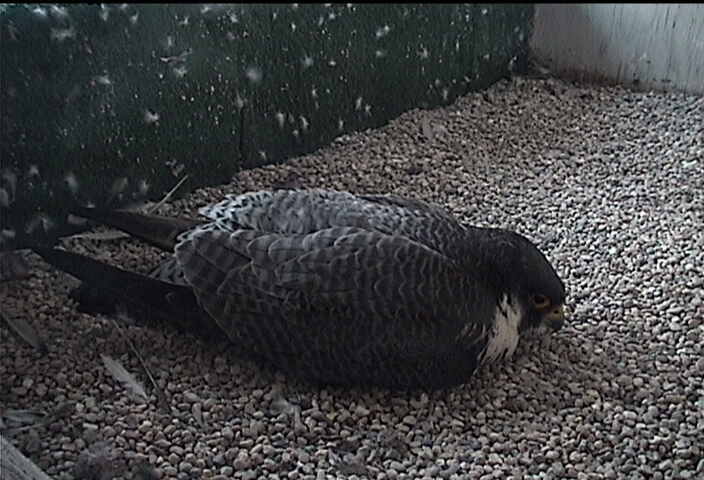 4-9-2019 – Female sitting on 3 eggs. 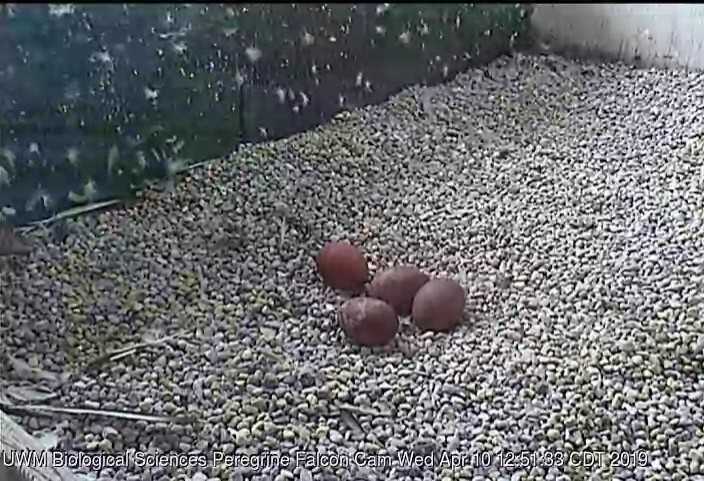 4-6-2019 – The 2nd egg was laid this morning. 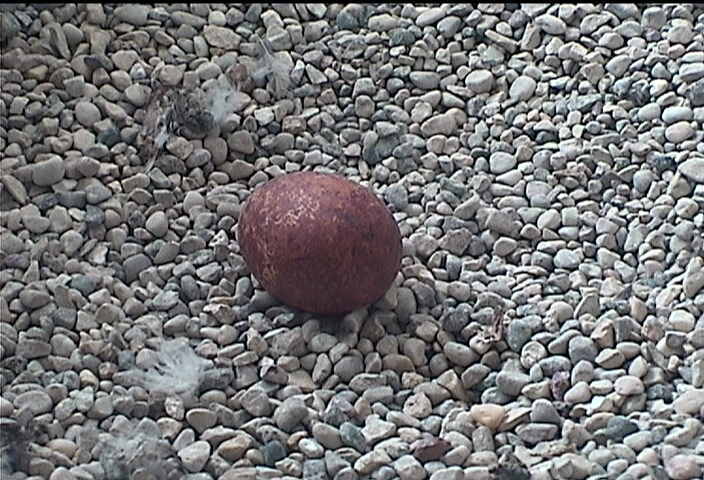 4-3-2019 – The first egg was laid at 6:10pm. 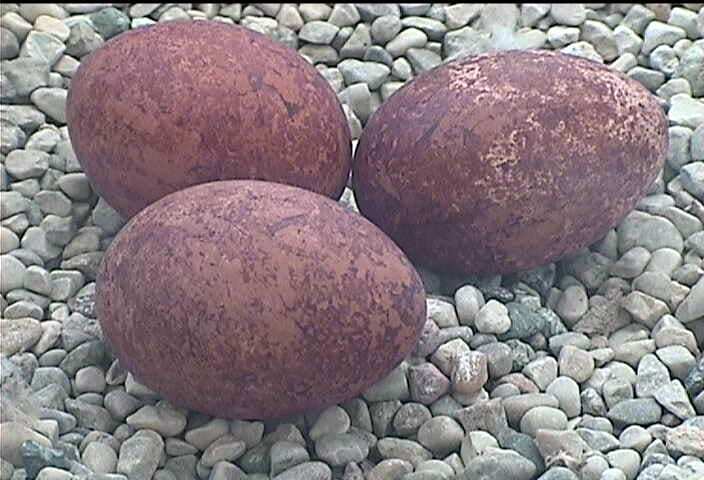 4-3-2019 – The first egg was laid today about 6:10pm. 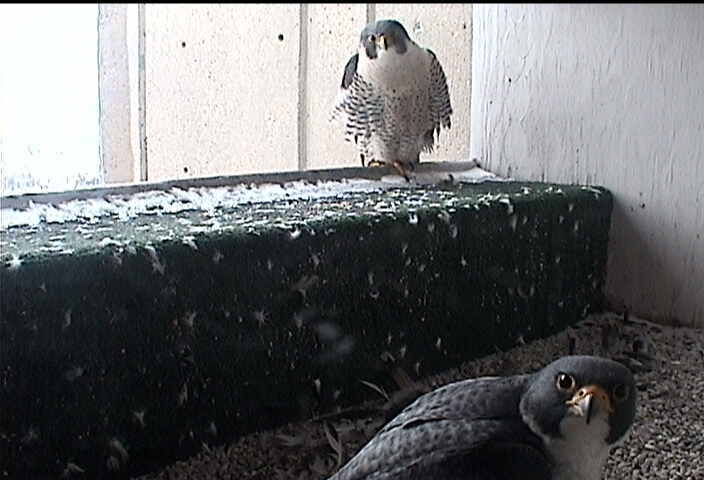 3-26-2019 – Male (left) and female in the nest box. 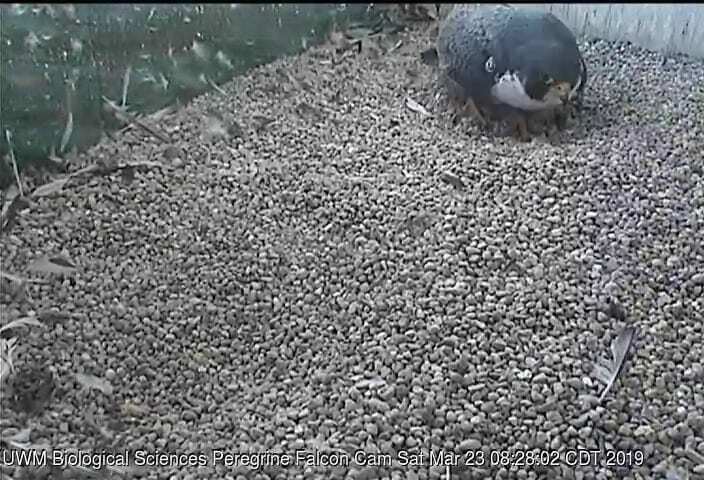 3-23-2019 – The male is deepening one of the scrapes. 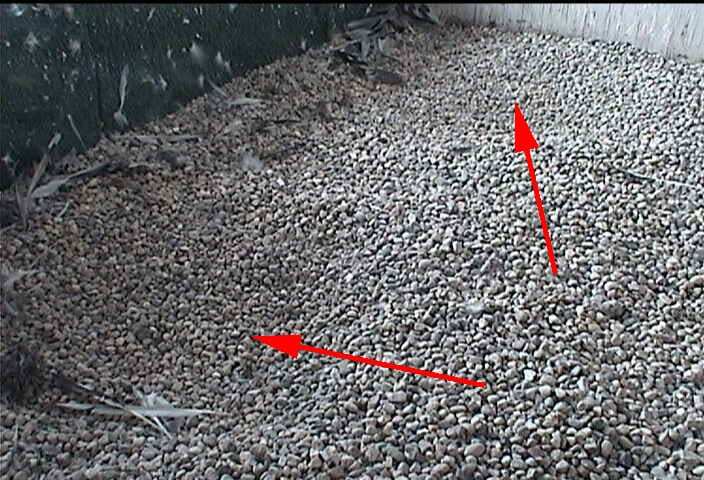 3-21-2019 – 2 new scrapes (red arrows) have been formed in the gravel bed. 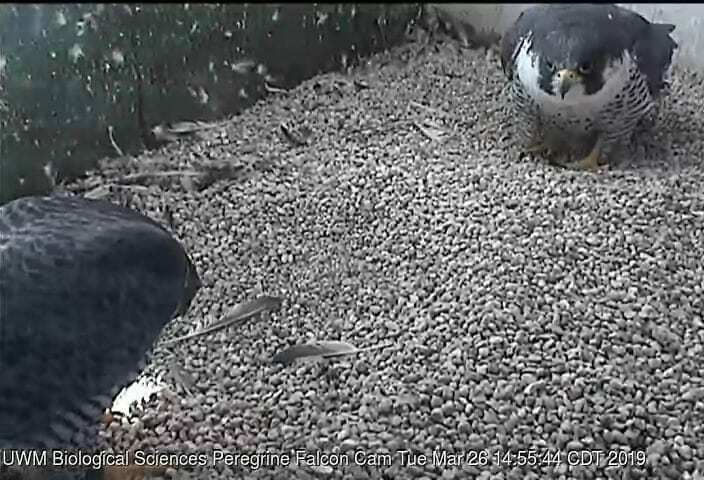 3-19-2019 – Lightning is still the resident male. 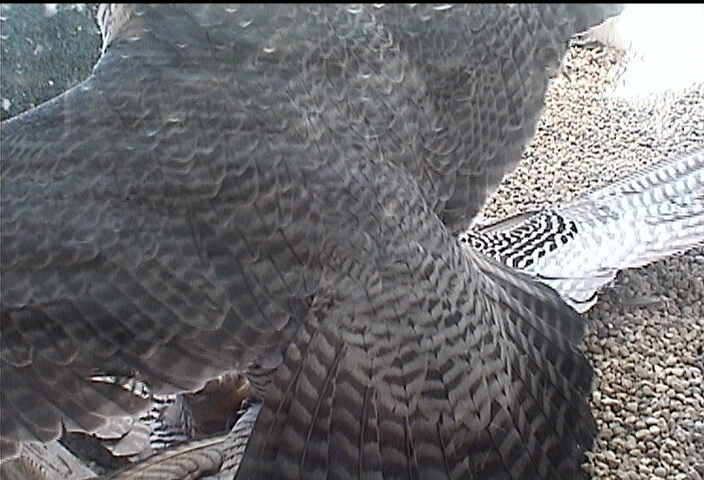 3-19-2019 – Looks like our unbanded female is back and claiming her nest. 3-19-2019 – The fight continues. 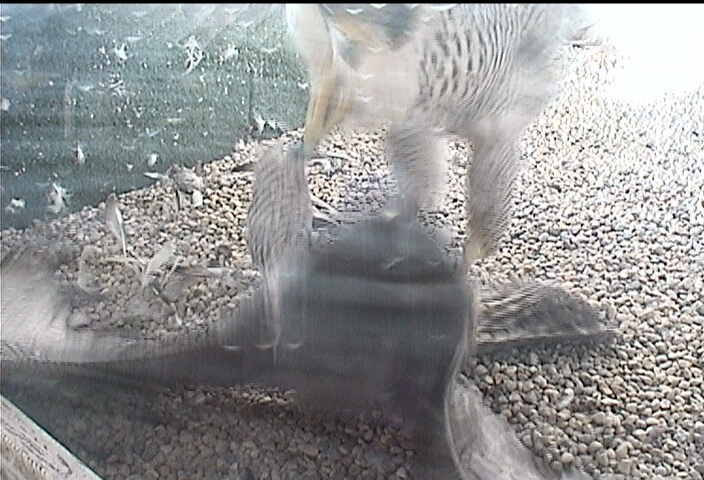 3-19-2019 – Two females were seen fighting in the nest box this morning. 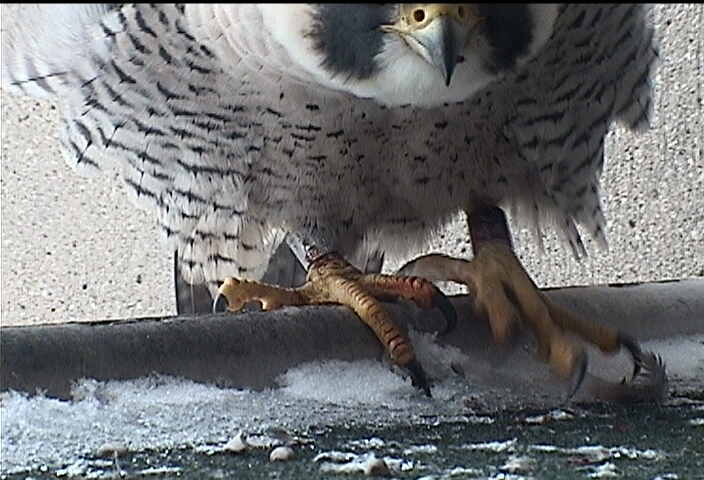 3-15-2019 – A new male 89/N b/g, Skyy was seen in the nest box. 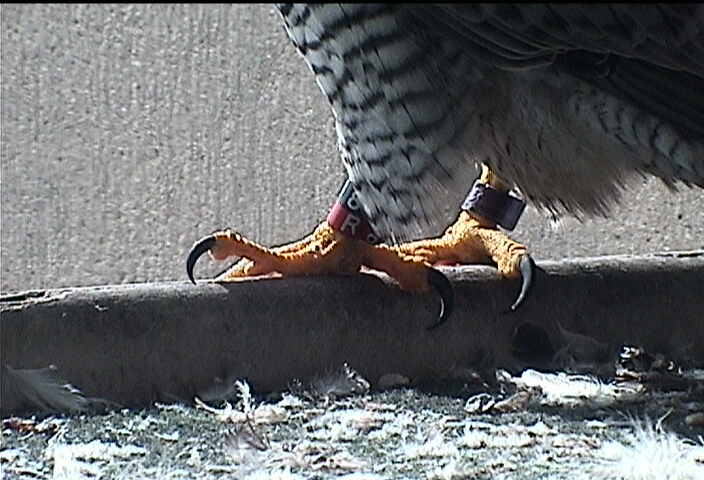 3-9-2019 – Lightning (b/r) 84/R, our male for the past 4 years is back, displacing Wildcat for the second year in a row. 3-9-2019 – Lightning is back. 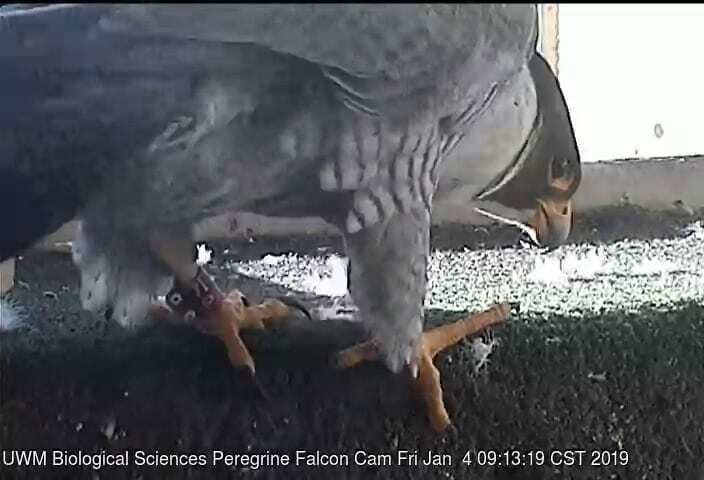 2-27-2019 – The 2 new birds in the nest box. 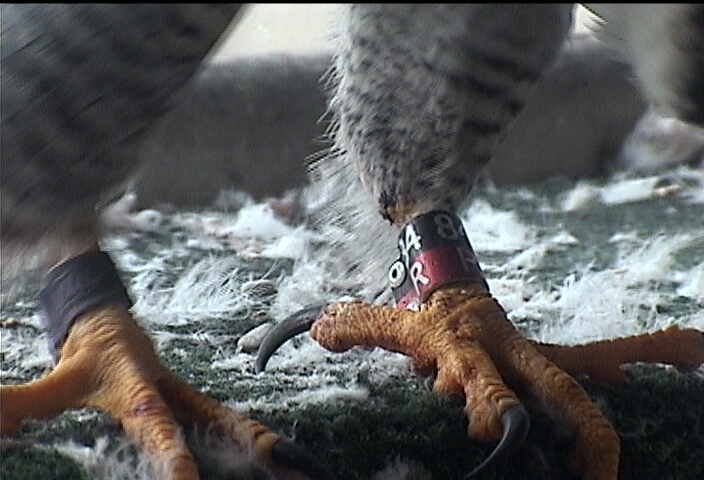 2-27-2019 – A new female, b/r C/44, Agatha has been at the nest box the last few days. 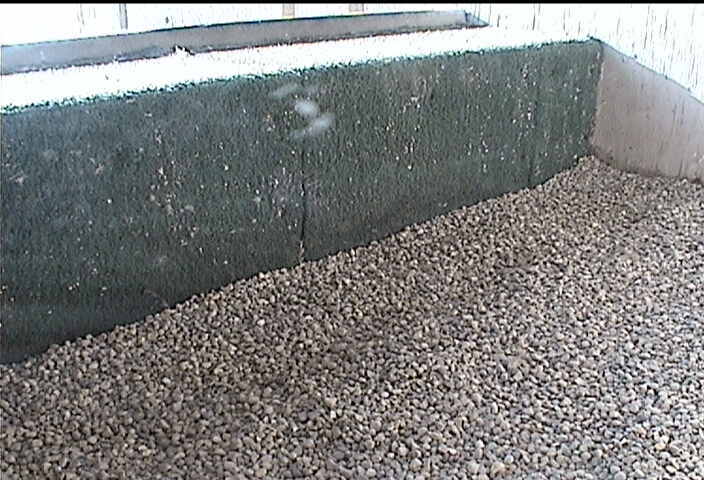 1-4-2019 – A new male, Wildcat, b/r 71/P has been at the nest box for several weeks this winter. 12-11-2018 – Cleaned and ready for next year.